Cornelia Bullock: You really think you're going to like it here? Godfrey Smith: Well, I must admit it's more desirable than living in a packing case on a city dump. The screwball comedy was a staple of the late 1930s Hollywood cinema, and My Man Godfrey really started the ball rolling. The genre features the goofy rich, usually set off against a level-headed man who is alternately dumbfounded, amazed, exasperated and finally charmed by the daffiness on display. A cruel scavenger hunt that includes as a goal a "forgotten man" leads members of the wealthy Bullock family to the City Dump, where a number of derelicts live. Among them is Godfrey 'Duke' Smith (William Powell), who rejects the offer of five dollars to go on display by pushing Cornelia Bullock (Gail Patrick) into an ash pile. When she leaves, her more sympathetic sister Irene (Carole Lombard) approaches Godfrey and prevails upon him to come with her. When Irene wins the hunt, she offers Godfrey a job as the family butler. Spruced up in a rented suit, Godfrey finds himself much more dignified and intelligent than the remainder of the family, which is full of goofiness, drunkenness, venality and generally whacked out personalities. When trouble rears its head, however, Godfrey is there to save the day, while simultaneously trying to avoid Irene's romantic advances. The high point of My Man Godfrey is the impeccable cast. Powell is perfect as the bitter forgotten man making a new life for himself as a dapper butler. Carole Lombard is engaging as the utterly dippy blonde Irene with an endless patter of lovesick nonsensical babble. Eugene Pallette and Alice Brady are wonderful as the long-suffering father and the eternally tipsy mother. But the highlight is Mischa Auer as Carlo, the parasitic protege of mother Angelica Bullock, constantly stuffing his face while pretending to be artistic. Yet he performs on command like a pet monkey (in fact doing a berserk imitation of a gorilla!). What really makes this a classic, however, is the contrast between the idle rich and the misery that was the lot of the common man during the height of the depression. This serious background gives the humor a resonance that simultaneously tugs at the heartstrings. At the same time, the wickedness of Cornelia is presented with a human face giving her a character well beyond the stock slapstick character that she could have been in lesser hands. Most pleasantly, the comedy all comes through extremely well even after 65 years. The humor centers on human frailties and failings that haven't changed at all in the last seven decades. 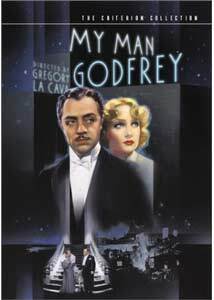 In all, My Man Godfrey is a sheer delight and highly recommended. Image Transfer Review: After seeing the bad to miserable quality of the other releases of this picture on lesser DVD labels, I approached this disc with some trepidation, especially in light of the vast torrent of DVD product that Criterion has been releasing lately. I need not have been concerned; the video looks gorgeous. Other than a couple of frame jumps and a handful of speckles, the picture looks pristine, with rich dark blacks and plenty of shades of grey. There is a good deal of grain present, but this appears to be a remnant of the original film. Detail is sharp and crisp throughout. Practically flawless, the video transfer is everything one could want. Best of all, it's presented in RSDL format for maximum image quality. Audio Transfer Review: The original mono is occasionally slightly shrill and a little tinny, but I didn't detect any significant hiss or noise. For a film from the 1930s, this sounds absolutely exceptional, comparable to the Universal Frankenstein. Extras Review: Criterion gives us a very nice special edition. Placing the film in its proper historical background are WPA newsreels of both the rich and the poor, as well as a commentary by Bob Gilpin, who teaches the film as both cinema and history. His remarks sometimes get a bit on the pretentious side, but he does do an admirable job of explaining the canvas upon which the movie is painted, as well as providing copious anecdotes about the cast and crew. Amazingly enough, there are a set of outtakes of the cast screwing up their lines (filled with profanity). Not profound, but it's certainly not something one would expect to have survived all these years intact. A set of several dozen production stills is included, as well as a re-release trailer. Wrapping up the package is the radio adaptation of the film with the original cast, except the addition of a very young David Niven in the Alan Mowbray role of Godfrey's friend Tommy Gray. Considerably tighter than the film, it's not as funny, but an interesting look at the same situation. The audio quality is quite good, and includes the intros by Cecil B. deMille and the original Lux advertisements, which are highly entertaining all by themselves. As far as the disc goes, the layer change is badly placed in the middle of a scene; there are numerous fades to black where it would have been completely innocuous. Chaptering is adequate, but no more. The menus for each individual section are artsy, with lights mimicking the title credits, but this renders them largely unreadable. These small flaws aside, an excellent package. There are several Godfreys on the DVD market, of dubious legality and quality but this is definitely the one to have. From a gorgeous video presentation and sharp audio to the bucketsfull of extras, this is a class act all the way. Very highly recommended.